Nokia has unveiled the Lumia 710, a Windows Phone device, as one of two new devices launched by the struggling Finish handset maker today. 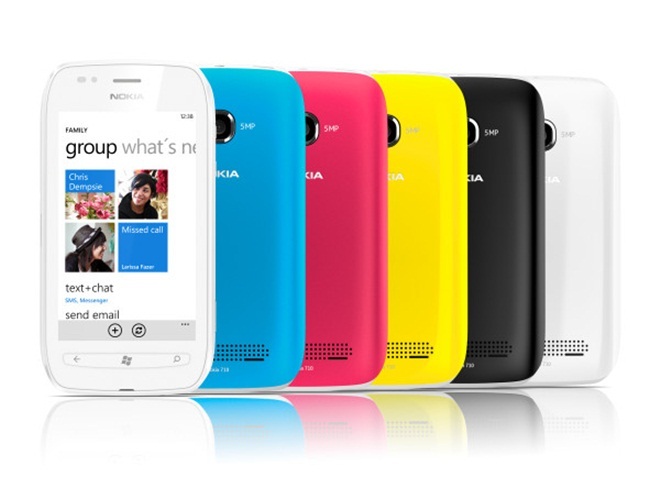 The Lumia 710 is an “affordable”, lower-end version of the Lumia 800 smartphone which shares the same 1.4 Ghz processor and was also introduced at the Nokia World event today in London. Click here for our hands-on coverage of the Lumia 710. The phone boasts a 3.7-inch LCD “ClearBlack” display, with 16GB of storage and a Carl Zeiss camera. It comes with a range of changeable covers, available in white, blue, pink, yellow and black. Nokia is describing the devices as “stylish and smart” and both include support for Nokia Maps, and a range of co-branded accessories with Monster. A demo of the search system on the phone is below. Both Lumia devices are available to preorder from Nokia.com from today, according to the company, with the phones launching in France, Germany, Italy, Netherlands, Spain and UK in November with plans for launch in Russia, India, Singapore, Taiwan and Hong Kong by the end of the year. The Lumia 710 is set to retail at around 420 Euros, according to the Finnish company which has plans to extend its availability across Europe and into Asia and North America in 2012. Nokia CEO Steven Elop has described the company’s new Lumia range of device as “the light [which] is a new dawn for Nokia”. Nokia has put its faith in the Windows operating system (OS) as it looks to regain market share in the smartphone market where it has been overtaken by Apple, BlackBerry and a range of manufacturers employing Google’s Android OS. Nokia, a preferred partner, was a coup for Microsoft to secure. Its decision was controversial, but it has thus far saved Nokia from being ‘yet another Android OEM.’ If today’s announcements manage to gain the firm mindshare, it could have put forth its first step on the road to recovery. You can find all of our NokiaWorld coverage here.